Scuff Free (Anti-Scuff) Thermal Lamination Film has a top coated, scuff-resistant matt BOPP finish and an extra matt look. The matt surface has a high dyne level for coatings, hot stamping and UC inks. It avoids minor scratches that will normally occur to the surface of general matt lamination films. Now it has been widely used in the custom packing industry as well as for high-end book covers, case bound books, book jackets, corporate brochures, product branding as well as a variety of other high-quality custom graphic solutions. It is ideal for luxury packaging and is excellent for any product where high scuff-resistance is needed to add value to presswork. 1 inch anti-scratch thermal lamination film mini roll is designed for quick printing shops, which laminate prints with small laminators. Normal sizes including 300mm, 330mm, 360mm, 400mm, 420mm, etc. People also call it as anti-scratch film, scratch resistant film, scuff free film, anti-scuff film, etc. Why chooses NEI matt scuff free thermal lamination film? 1. The best color deepening. No more color tonality change after lamination and dark colors intensified. 3. Safe operation: Non-solvent based adhesive is used so it will eliminate the fire hazard that is caused by the use and storage of flammable solvents. 4. Excellent performance: Compared with wet lamination, thermal lamination film enhances the color saturation and brightness of presswork. It also has stronger ability of absorbing powder and adhesive force. Furthermore, it is effective to prevent being blistered or separated from presswork in lamination process. As it has strong adhesive ability and surface tension, it can be used for latter processes, including spot UV, hot stamping, die cutting, indentation process. 5. Easy handling: Once the required temperature and pressure is met, lamination can be easily operated. No other special technique is required. 6. High efficiency: Production cost and labor cost are reduced substantially as there is no film wastage, mixture of adhesive solvent, or no UV heating lamp (drying system) is required. Therefore, it saves production space as well. 7. Wide adaptability: It is widely adaptable to different types of lamination machines, including wet and dry laminator. Only small adjustments need to be made to the machine if wet laminator is used. 1. 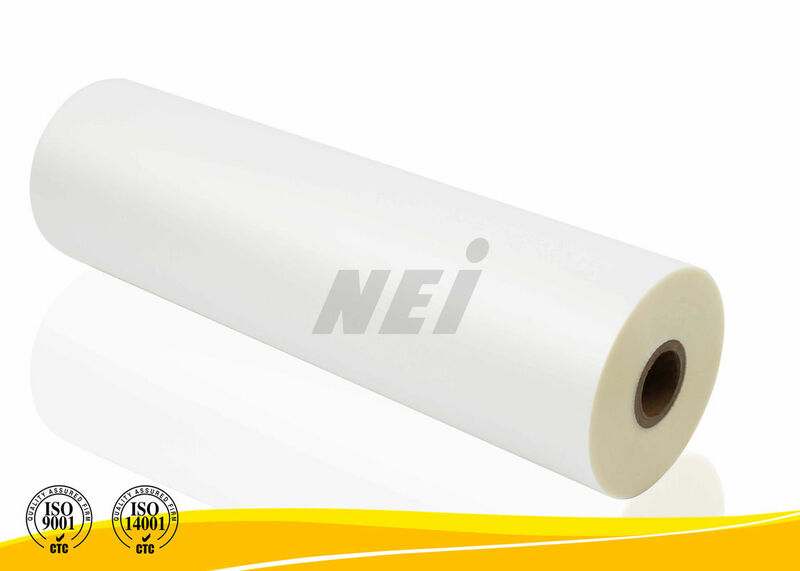 NEI scuff free thermal lamination film is suggested to be laminated with the roller temperature range of 85 to 110°C and roller pressure of 10 to 20 Mpa. However, the optimum conditions are depending on the selected laminator’s speed and dimensional stability. 2. It is advised that the printed surface must be well dried before lamination and cools sufficiently one surface before laminating to other surface. Failure to comply with these suggestions will most likely cause pre-mature delamination.